An easy, gluten free vegan French bread recipe using the water from chickpea cans (aquafaba) as egg replacers. Crusty on the outside and soft in the middle! I’m pretty excited about this post today because it’s been a long time coming! 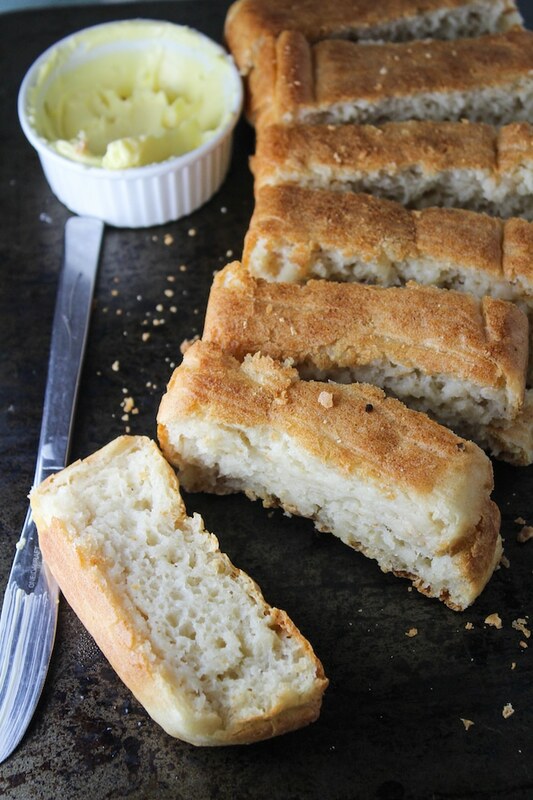 Easily my most popular recipe that I’ve ever shared on A Saucy Kitchen has been for my gluten free French bread recipe. It’s easy, it doesn’t require 50 different types of obscure gluten free flours, and above all it’s just really good! I’ve made that bread countless times this past year, and I’ve heard from a decent number of readers on here, Pinterest, and on Instagram about how much they loved it as well. 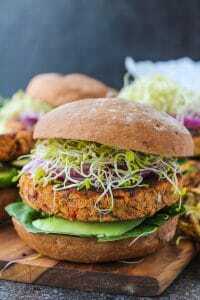 Let me just back up for a moment first and say that one of my absolute favorite things that I’ve really grown to love since starting this blog is being able to share allergy free recipes that most people can enjoy. Food intolerances are no joke. It’s always a pleasure to stumble across recipes that fit the diet criteria and look good. So when I got a reader comment on the last recipe asking about potential egg substitutions it got me thinking about making a gluten free vegan French bread. When it comes to egg replacers I usually stick to things like banana and pumpkin. Chia seeds and flax seeds are well known vegan egg replacers, but I can’t seem to get the texture right in baking. Same with gelatin – great for granola, not so much for breads. Eventually, another reader came along (Thanks, Jessica!) and suggested possibly using aquafaba as an egg replacement which got me thinking. I had recently heard about aquafaba being some sort of miracle egg replacer in vegan baking that I decided to try it out myself. Aquafaba literally means bean water – as in the water that you and I used to pour down the sink when draining a can of chickpeas. This website answers a lot of the questions you might have on aquafaba, but basically what you need to know is that the water from the chickpea cans mimic the proteins in egg whites making it a really great egg substitute for things like meringue or mousse. How cool is that? As a rule of thumb 3 tablespoons of aquafaba is equal to 1 whole egg. However, this can depend on what you’re cooking and the consistency of the water. Ideally you want the water to be thick and a bit slimy – basically like real egg whites. Since the original recipe calls for egg white specifically this is perfect for our recipe! Just like the original version the dough will look pretty wet and unusual compared to regular gluten filled doughs. You will have to spoon the dough into your bread pans so don’t be alarmed that you did something wrong. Make sure that your yeast is still good before adding it to the dough. If the sugar-water and yeast mixture doesn’t foam that means that either your water wasn’t warm enough or the yeast is off. Best practice for storing yeast is to keep it in a cool, dark place like the fridge. This bread is best on the first day, but you can keep it 2-3 days covered. If you try this, let me know how it goes in the comments, or tag me on instagram with #asaucykitchen so I can see what you made! Have you made anything else with aquafaba? I’d love to know your own experience working with it! 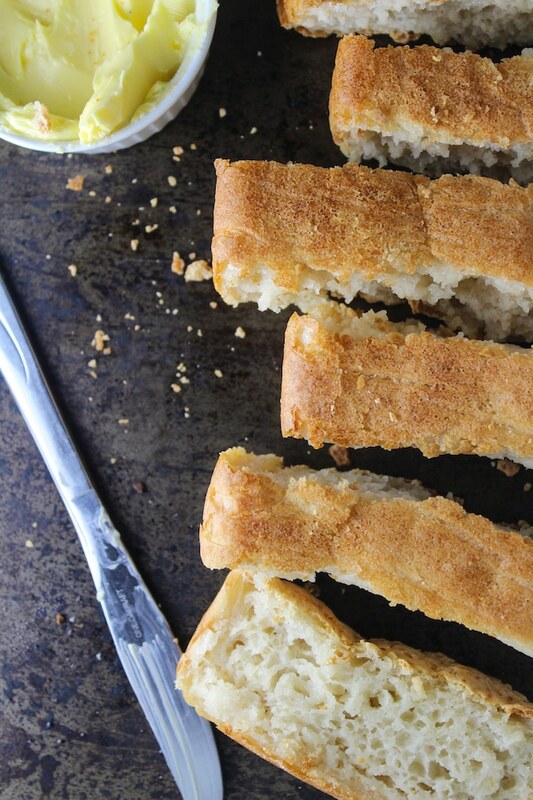 An easy, gluten free vegan French bread recipe using the water from chickpea cans as egg replacers. Crusty on the outside and soft in the middle! In a large bowl, stir together your flours, psyllium husk, and salt. In a small bowl mix your hot water and sugar together and stir until the sugar dissolves. Make sure that your water is warm enough for this step so that your yeast proofs and the bread rises. Once the sugar dissolves, gently stir in your yeast. Set aside and let the yeast foam up for a few minutes. In another small bowl add the aquafaba, oil, and vinegar and whisk until you get a slight foam. Pour the yeast mixture into the flour mixture and mix with an electric mixer. Once the two mixtures are fully incorporated, add the aquafaba mixture and continue mixing for another couple of minutes. Grease or line two loaf tins or one french bread pan and spoon your batter into each tin. Cover and stash in a warm place for at least 30 minutes. Since our kitchen is usually freezing, I like to stow my dough in the microwave for the rising process which keeps the dough free from drafts. After your dough has risen (about 30 minutes) preheat your oven to 400F/ 200C. Bake for 40 minutes, turning the dough about half way through for an even bake. Remove from the pan and cool on a wire rack and then enjoy! Hello!! Reading the recipe I see 1 1/2 cups of water, is that right? It seems like a lot of water. Is it 1 1/2 cups or 1/2 cup?? Hi Millie! It is 1 1/2 cups! Hi Carol! While I haven’t tried this recipe exactly using a flour blend I do think that it would work. The rice/tapioca flour kind of act like a really basic flour blend. I actually also have a gf/vegan focaccia that’s very similar to this recipe that uses a flour blend if you wanted to check that out too https://www.asaucykitchen.com/gluten-free-focaccia/ You could always make the focaccia base without all the toppings and it will be pretty similar to this. Learning to cook all over again and tried this vegan French bread tonight. It was a total hit! Even without the right pan, it was soft and crusty and delicious. Take a bow. Take another bow. Can’t wait to try the other recipes, but bread hunger was not to wait another day. Done with psyllium husk, aquafaba, tapioca and rice flours. What a great surprise! Thanks! Yay! I’m so glad to hear that! Thanks so much for coming back to let me know what you thought! I loved the original recipe. How many eggs did I need for the original? I was getting ready to make this and the recipe has changed! Hi Donna! The recipe didn’t change – this is just a different one. The original one is right here: https://www.asaucykitchen.com/easy-gluten-free-french-bread/ Glad you like it! I imagine it would also make an AMAZING base for a garlic bread. That makes me so happy to hear! Thank you so much for coming back to let me know what you thought – totally makes my day! The first gluten free French bread recipe I’ve tried that is like claimed: soft in side and a nice crust! And the first one ever tried with aquafaba. The only problem was to turn the bread halfway, it sticked terribly to the pan, I think I’ll dust the pan the next time, or use parchment paper..
As with the normal French bread: don’t wait to long eating it. I baked it for diner, and this morning with breakfast it had become chewy. Although the taste was still good. I’m glad you liked it! Good point on eating this fresh – wait too long and it doesn’t do this any justice. Thanks for coming back to leave a comment/review! I’ve tried to make gluten free french bread several times (not by this recipe) but every attempt fell. Any tips on keepiing my loaves from falling when I take them out of the oven? Hi Deb! I’ve looked up that issue in the past when I had issues with bread falling. One thing that popped up over and over again in a lot of baking forums was people saying that it’s possible the dough was over proofed. If the dough is left to rise too long or the conditions are too warm it will cause the bread to rise nice and high only to deflate after baking/when you cut into it. In most cases people were discussing recipes with gluten in it, but I’ve found that this can sometimes happen in gluten free recipes as well. I like to let my dough rise in the microwave (not on) because it’s out of the way in a controlled environment/temperature. Another thing you could try is to cook the bread at a lower temperature for a longer time. I’m not exactly sure why that works with gluten free bread, but I know it does. 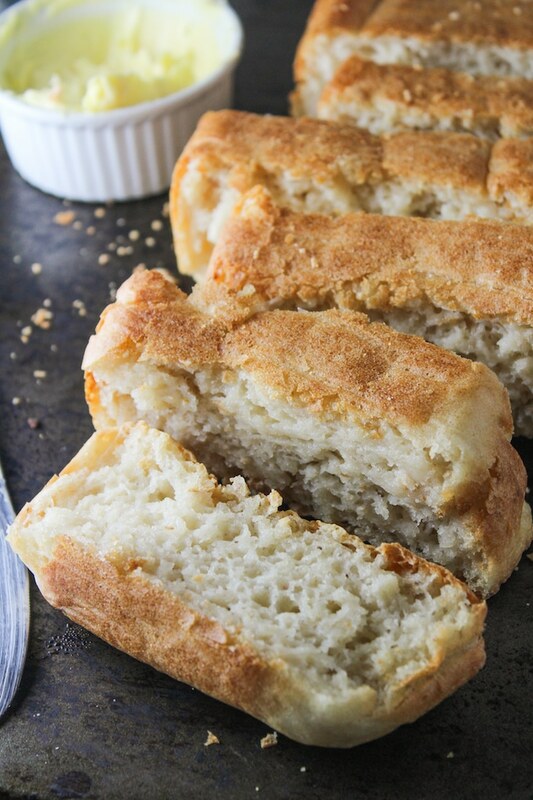 Have you tried making a cassava flour loaf? I’d love to hear about it if you have esp using aquafaba. My family are all on an AIP so diet is tough! Hi Kay! I haven’t been able to play around too much with cassava flour because I have a hard time getting it here in the UK, but you might be interested in checking out Heather’s blog http://cookituppaleo.com/ She does a lot with cassava and even has quite a few AIP recipes. If you are interested in experimenting with aquafaba the main rule of the thumb I go by is that 3 tablespoons aqaufaba = about 1 egg. From my limited understanding of cassava flour – it’s supposed to be pretty similar to wheat flour so I would think it would work with aquafaba in some cases. Hope that helps! to the end and allowed it to cool overnight. which could have helped it turn out amazing. interior…just as a french boule should have. toasted it this morning and it was delicious! This will be my first attempt using Aquafaba for bread. However I use it for mayo, muffins, fish and chicken batters, pancakes and cakes with great results. I love the stuff. I’ve told everyone who listens about it and have been told they to use it. Thank you for your posts.This too I’ve emailed to friends and family. I always forget that you can use aquafaba to batter things! I’m going to try that one out soon – it’s good to know because I occasionally get asked about egg free batter substitutes. Thanks for reminding me! Hi! I just made this recipe yestetday… I am so close! The crust is perfect and it tadtes great but the middle remains doughyish. Do you think it’s a yeast issue? I yried to different batches, the first one was clearly dead and the s3cond one only had a couple of bubbles. Obviously I am not an exerienced bread maker 🙂 Thanks. Excited to get this right and wow/surprise all my friends and family. Hi Robin! It sounds to me like the oven temperature might be the problem here – at least that’s usually the case for me when things are cooked on the outside but not quite on the inside. Since ovens quite often vary in temperature it might be a case that your oven runs a little hotter than mine. I would try lowering the baking temperature by at least 10°F so that the outsides cook slower. Also – what’s the rack position that you’re baking on? Try moving it to a middle or lower rack so that the heat distributes as evenly as possible. I hope this helps! Let me know if need anything else and I’ll try my best to help you figure it out! What else is aquafaba used for? Just baking? I am so intrigued. We go through a lot of beans here…I love that I could actually use that water! Your bread looks wonderful. We don’t have any special dietary restrictions here but when my youngest was very little, he was allergic to wheat, so we actually went completely gluten free to avoid any possible issues. We ate that way for 2 years, and discovered a lot of gluten free recipes that we loved, so I still make them. I’d love to try this! I am vegan so all my recipes are eggless though I find the texture to be dense. Can I add in the Aquafaba to make the cakes/muffins light and fluffy even though the recipes does not require eggs? Hi Samantha! I’ve found it’s best used as a binder or thickener – so things like meringue and mousse are perfect for it. That being said, I’ve seen a lot more people using it in muffins and cakes with a lot of success. You might be interested in this facebook group https://www.facebook.com/groups/372343816286624/ It says ‘Vegan Meringue’ in the title, but a lot of people post their aquafaba experiments and offer advice for cooking with it. Hope that helps! Aloha! This recipe looks delicious and is going to be my first time working with aquafaba. I’m so excited!! One question, the two cups of rice flour, what type of rice flour, brown or white? I’ll be making this bread soon and will post how it comes out. Mahalo for the recipe! Hi Angie, thank you so much! As for the rice flour you can use white or brown. The main difference between baking with brown is that it’s considered a whole grain so it has a better nutritional profile than white. It can however make baked goods a little heavier, but I don’t think there’s too much difference with this recipe. Good luck! Apparently I need to get on the aquafaba bandwagon! I’m sharing it on Savoring Saturdays this weekend. Thank you for linking up! This. Looks. So. Good. I’ll be featuring it tomorrow at Savoring Saturdays! Thanks for sharing it with us. What an interesting recipe!! We make bread all the time and we collect recipes for different types. Thank you for helping to add to our collection. Your recipe sounds delicious. This sounds so good! I’m not vegan, but I’ve been meaning to try using a chickpea egg. I figure it’s more heart healthy than a chicken egg! Wow, what a fantastic loaf! It looks absolutely delicious. 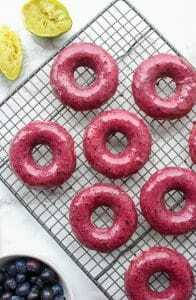 I love the use of aquafaba here – awesome idea! I’ve only used it to make meringues so far, and it was AMAZING! I could barely believe what was happening before my eyes. Truly astounding, and I wish I had known about it back when I was vegan! Thanks, Lisa! I’m excited thinking about all the possible things you could do with aquafaba. To think that you can use bean water to make something like meringue – it’s just so cool! I used to love making bread before we had to go gluten free and I can honestly say that making gluten free breads is so much easier because you don’t have to worry about over working the gluten. Hope you like it! I have to try this! The bread looks delicious! That is some yummy looking french bread. This is definitely the most unusual french bread recipe I have ever read. Gluten free vegan bread making opens an entire universe of creativity and flavor I have never experienced! I’m pretty tempted to try it! It really does just open up so many different possibilities – I’m excited to start experimenting more with aquafaba! This looks really good! I can’t wait to try it! This bread looks so good, what a great idea to use aquafaba as an egg substitute, it would be great for those with egg allergies, I will have to give it a try! This is as good looking brad as I have ever seen; what a wonderful gift for those who are gluten free! Thanks so much for sharing this idea! This French bread looks soft and delicious. Great idea using the water from the chickpeas as a binder. How interesting! Wouldn’t the bean water be mostly starch tho? I love the look of this bread!